Don’t worry pain in your middle back (thoracic spine) is quite common. It is not quite well reported in journals¹ unfortunately so doesn’t get the attention like neck and back pain do. First I think you should know a bit of the general anatomy of the area concerned. The area of the upper back (spine) between the two shoulder blades is called the thoracic spine. The shoulder blades are called scapula. Looking at the picture on the right you will see from Gray’s Anatomy a drawing of the mid-back, upper-back and the surrounding back muscles. Can you see where your shoulder blade pain could be now? I hope this anatomical picture helps you visualise your mid-back and upper-back structure better. As I mentioned earlier there are many times a person will come into see a chiropractor for treatment because of this pain in-between the shoulder blades and spine that they cannot get rid of. It feels like I have a muscle knot stuck underneath my shoulder blade. Do some of these symptoms sound familiar to you at all? These are just some of the typical things I might hear people say about a problem in their muscles, joints or nerves of the thoracic spine. Of course once your told your chiropractor your symptoms you’ll want to know what causes this shoulder blade pain. This is the next question I want to help you answer. Below are some of the normal mechanical causes and then the more serious causes of thoracic pain. Does it feel like you got a rib out? You have twelve ribs on the left and right side of your thoracic spine. The ribs move like a bucket handle, going up and down with breathing in and out. There are times movement of the rib head on the vertebral body can cause pain. I usually find the 3rd and 4th ribs are the most tender to touch. 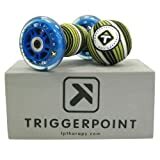 A trigger point is basically a muscle knot. I easily find a common problem in these thoracic muscle trigger points in one of the upper back muscles, especially the levator scapulae. This is the time when you want people to rub your shoulders or you try to get something hard like a golf ball or tennis ball to push into your back. Trigger points can cause referred pain away from where themuscleknot is found. Here is a picture of some thoracic trigger points in the neck,scapula and thoracic muscles. The spinal joints (facets) can, like the ribs, move abnormally causing a pain in the middle of the spine. Maybe you have heard your chiropractor mention a condition called, T4 syndrome. I find that a lot of people have tenderness over the T4-5-6 vertebrae region. I think this is because of our seated posture when we tend to slump our shoulders through this area. This in turn over time will cause stiffness to move and tenderness to touch. Got a trapped nerve in neck pain? Mechanical neck pain can also be a cause of pain near the shoulder blade and top of the shoulders. A cervical spinal nerve refers pain away from the neck commonly down the inside of the shoulder blade and outer arm. So your pain could be coming from your neck where there is a pinched nerve condition. There are times when you can get an organ in your body causing back pain.This is called visceral pain. You can experience referred pain from an internal organ like your liver, gall bladder, stomach, spleen, lungs, or pericardial sac. If you want to find out more about visceral pain you could read medical student Brad’s post about referred organ pain. You can see a picture below of visceral pain referral patterns in the front and back of us. You might also experience shingles around tour chest. If you are stressed out and immune system run down the typically dormant, herpes zoster virus, can become active. The herpes zoster virus lays dormant in our spinal nerves near the ribs waiting to attack when we are down. You might get the typical shingles rash only after the chest pain starts. Trapped wind pain is typically caused by indigestion in the stomach. Trapped wind discomfort can though be a sign of a more serious heart attack. Heart attack symptoms are of suddenly break out into a sweat, go pale, feel nausea, pain down the left arm and around the shoulder blade and a tight closing in chest pain. You can watch the video below of a chiropractor performing a basic mechanical assessment of the middle and upper thoracic spine. Mobilising the thoracic spine can release a lot of spinal tension. So now you know what some of the symptoms and common causes of shoulder blade pain. As you may have read above there are times severe back pain can be coming from a more serious cause. If you are worried it is easy to have a health professional help you out. You can find a UK chiropractor here to be assessed. Warmth is a simple self-treatment for muscle tension. Using a microwaveable wheat bag, hot water bottle or a warm moist towel apply the heat to the painful muscle to try relax the muscle knot. I prefer using heat in the neck and upper back. You could try using a chair or hand-held massager machine to try relax any muscular tension between the shoulders. You probably have asked a loved one for a muscle rub. You could also see a massage therapist for a deep tissue massage for chronic tension in the upper back and neck. The cat stretch is when you slowly try round your shoulders as much as you can whilst pushing your spine backwards to get a stretch between the shoulder blade muscles. Sometimes this is easier when you are warm, like after a shower or bath. It is amazing how a good night sleep can help the body to heal itself. So try get a good nights sleep to see if that helps the pain go away. Sometimes having poor posture for too long causes our muscle knots and irritated rib or spinal joints. If you have been doing lots of sitting with desk work or computer work then try go do some gentle exercise to see if it can help stimulate your spinal posture. Avoid the 23 and half hours disease. I mentioned above how you need to exercise for upper back pain. For a weak back and poor upper body posture take a look at doing shoulder blade push-ups. I love these exercises as you can do it now at home to reset your thoracic kyphosis spinal curve. Have you been told you need to chill out? Do you know how to reduce stress? Emotional or mental stress can increase our muscle tone leaving us with tight tense muscles running into the neck,top of the shoulders and upper back. This is a normal flight and fight response. The ubber simple mindfulness training technique can help solve this problem. 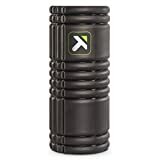 Watch the video below on how to use a foam roller on the thoracic spine. movement with breathing to try get some pain between the shoulder blades relief. I hope this helps you understand a pain between shoulder blades bit better. The above self-treatment list for upper back pain is not meant to be exhaustive, but it is something very simple for you to try if you wish.